I have lots of ideas about the perfect life. What that looks like, sounds like, seems to be, really is . . . I guess you might call me a bit of a perfectionist. I think my problem is that when it comes down to it, I often feel that the perfect life is my responsibility. I let myself get on guilt trips when I mess up in my “perfect scheme” for the “perfect life.” The problem is that I mess up . . . every day . . . multiple times. So, what’s the problem, and how do I fix it? If you follow my reading list, you’ll notice that I just finished a book called Calm My Anxious Heart: A Woman’s Guide to Finding Contentment . It was a tremendous book because it reminded me of truths that I know I knew, but had glossed over or forgotten. 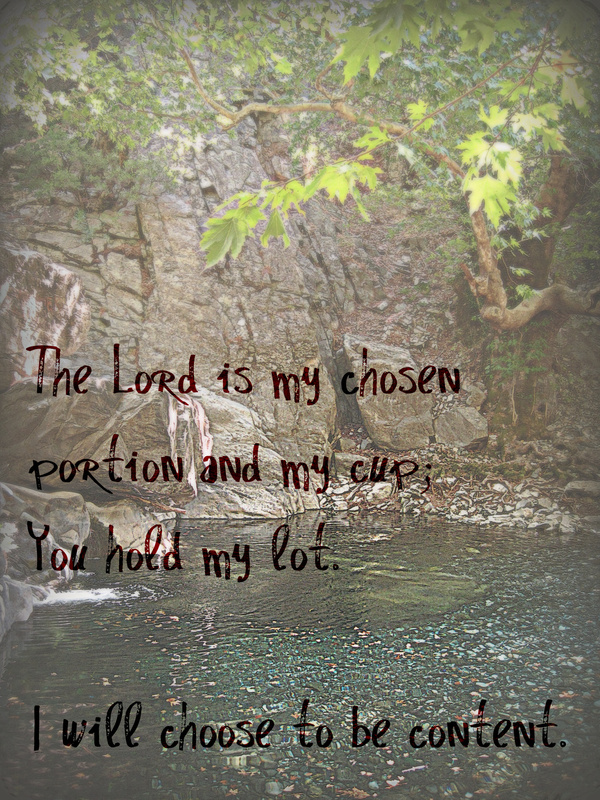 Things like God has assigned my portion and in everything give thanks. The author gave real life examples of ladies that had learned to trust that God really knew what He was doing in their lives and chose to be thankful and obedient under His hand. For me, this is a conscious choice. Because I often place the responsibility of doing everything right on my own shoulders, I often find myself discontent at myself. It takes a very measured amount of effort for me to talk myself through the truths I know that: God gave me this situation, God is watching me in this situation, God knows what I am doing in this situation, and God’s the only One whose judgment I care about in this situation. But, I am beginning to realize that I can talk myself through these truths. When I can work through the character of God, and what I know to be true about Him, then I can work through my own thoughts, and what I know to be true about me – then I can find myself at peace with whatever is going on around me. Linda Dillow, the author of Calm My Anxious Heart, challenged readers to never allow themselves to dwell on the “what ifs” and “if onlys” of life. Those things do not promote contentment, nor do they affect anything in reality. The way I look, what I said, the choice I made . . . can’t change, won’t change, and doesn’t need to change – because it was already appointed for me. My responsibility is to pick up and keep going, and keep looking forward to the glorious joys that will come. Being cast down in discouragement never gave me any satisfaction – but learning to live in confidence of who my God is and who I am is freeing and wonderful. A side-note: One of the things in my life that I have found to be a huge obstacle between me and contentment has been facebook. I think that in facebook, we have given celebrity status to our friends. In the past, people would peruse magazines, or the internet, to see what the newest styles were, what the big-shot people were doing, but it was always people who were so far above our status, that it didn’t really matter. Maybe we struggled with a bit of envy, but we really didn’t expect to accomplish the same things as celebrities. Well, now we peruse facebook with the same ideas, except now it’s our friends who are wearing the cutest clothes, or doing the most amazing things . . . and why are they better than me? It’s so much easier to get discontent when someone on my own level has something or does something that I don’t or can’t. Have I gotten rid of my facebook? No. But, I have tried to be more purposeful in my use of facebook. Rather than just getting on and browsing and getting caught up in what other people are doing or sharing . . . I try to make sure that I have a reason for getting on – to write someone, to check messages, to encourage someone, etc. And I also try to remember . . . I share the highlights of my life, and most everyone else does too. Just because everything they share may be positive and great, that doesn’t mean their entire life is. Contentment isn’t about looking at my life in comparison with everyone else and deciding it’s good enough, it’s about realizing that everything I have is appointed and gifted by God, and that’s more than I deserve! I read a great post tonight that was a great reminder of this as I thought of writing about the topic myself . . . also love the graphics she has as reminders to chase what’s really important, and not get stuck in the mud of the temporal!